The Warriors series used to enthrall me as a child. I remember spending long evenings on the beach reading the newest Warriors release; searching the library for books about herbs because I had decided that I wanted to be a medicine cat when I grew up; drawing pictures with my cousin of our own warrior cat personas complete with names, ages, and occupations. I’ve devoted days to the Warriors series over many years of my childhood, and for good reason. Warriorsis a series following clans of cats that live, interact, and adventure with one another. It is written by “Erin Hunter”, whose name is a pseudonym for four different coauthors, and was originally published in the early 2000’s. The Warriors are a group of feral cats who have carved out their own communities in the forest in separate clans: the ThunderClan, ShadowClan, WindClan, RiverClan, and Skyclan. These cats navigate relationships while fighting to preserve their communities against feral dogs, murderous spirit cats, and natural disaster. The books follow generations of cat families and the development of their traditions and communities while also exploring intricate topics such as unrequited love, spirituality, the coexistence of diverse cultures, and morality; and all under the guise of a children’s book full of fluffy kittens. The Warriors series is fun and easy to read, and has a good balance of new characters and plot alongside the central characters and signature backgrounds that make the books easy to digest. Well-written and easily understandable, the Warriors books are a wonderful way to teach your children about right and wrong, the formation and evolution of tradition, and the dynamics of friends and family. The Warriors series perfect for pre-teens due to its good combination of cute cats, easy-to-follow plot, and valuable life lessons. 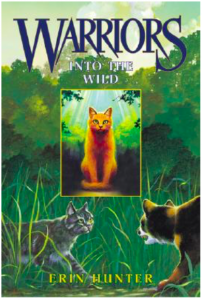 Although there are currently 6 subseries, I would recommend starting at the beginning: Into the Wild was the very first installment of the series, and is the easiest way to get an idea of the way that the cats live and how their societies are set up as well as to familiarize yourself with the way that Erin Hunter writes. Erin Hunter is a pseudonym for 4 primary co-authors: Victoria Holmes, Kate Cary, Cherith Baldry, and Tui T. Sutherland. Cary, Baldry, and Sutherland took turns writing the novels while Holmes focused on developing the plotlines. Holmes started the series in 2003 and the other authors were brought in over the next few installments. However, since then Holmes has left the team, and 3 other authors have been brought on. All of the authors are British, and all are also women. Oli Doyle is a book reviewer in the Bay Area. She lives in Oakland with her cat Lizzy. Free Comic Book Day Isn’t it Time You Ditched Audible for Audio Books?